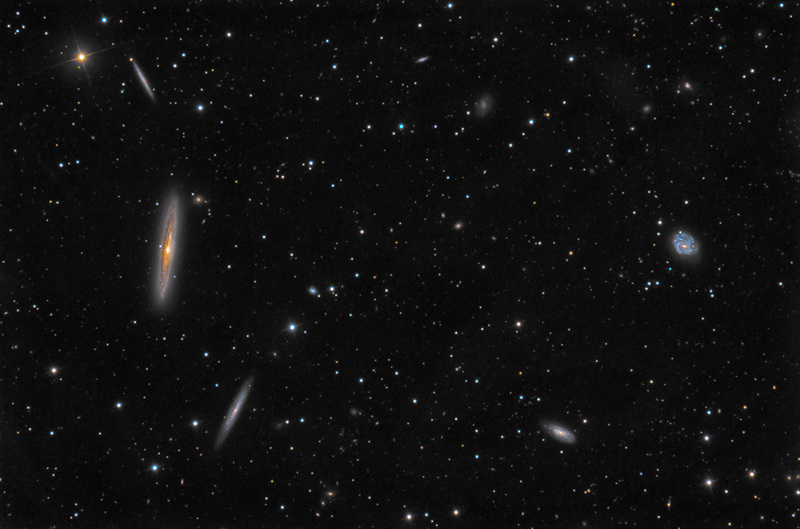 at 9 o'clock, is an edge-on spiral galaxy located near the center of the Virgo Cluster. At 40,000,000 light years distance, and 100,000 ly across, it is one of the largest and brightest members of the cluster. Nearly seven hundred globular clusters have been observed in its halo. Below 4216 is another beautiful edge-on NGC 4206, and above, near the golden star is NGC 4222. These three triplets seem to form a 'Stairway to Heaven'. To their right are NGC 4189 at 3 o'clock, and NGC 4193 at 5 o'clock. Several smaller members of the cluster can be found in the field.